Stay in a B & B by the tariff reduction of 14 € full board. Rooms with private bathroom with shower, hairdryer, direct dial telephone, satellite TV, safe and a spacious balcony with panoramic sea views. All Inclusive: Treatment includes full board with drinks at meals (water, wine, orange juice, lemonade, Pepsi, Beer), air-conditioning, beach service with 1 umbrella and 2 sunbeds in the beach. 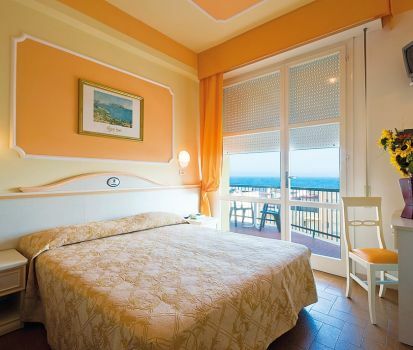 Prices per person per day in double room for a minimum of 3 days. Family Plan is valid for a period of at least 7 days, (25.05-15.06 / 29.06-07.07 / 25.07-09.08 / 01.09-15.09), 1 child up to 5 years old sharing room with two adults is free, from 6 to 10 years, 50% discount, 2nd child 30% discount. Cordialità dei titolari eccellente, servizio ristorazione davvero impeccabile con cibo ottimo e in grande abbondanza. La piscina Dell hotel é la ciliegina sulla torta molto grande e con la zona idromassaggio. Sicuramente ci torneremo il prossimo anno! !